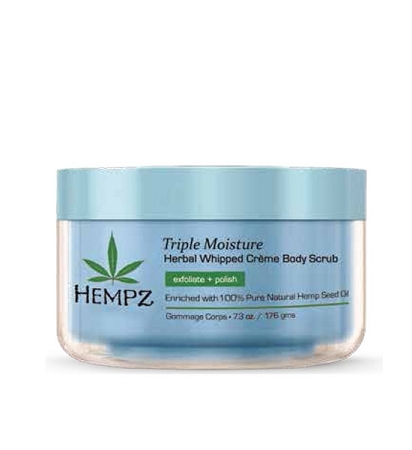 Hempz Triple Moisture Herbal Whipped Crème Body Scrub is enriched with 100% Pure Natural Hemp Seed Oil and fortified with our exclusive all day Triple Moisture Complex™ of hydrating Yangu Oil, Vitamin rich anti-aging Apple Fruit Extract, Potassium-rich Cogon Grass Extract, and finely crushed walnut shells. • Exclusive all day Triple Moisture Complex™. • Cleanses and exfoliates to help soften and smooth skin. • Hydrating Yangu Oil is rich in antioxidants and fatty acids that help protect, tone and moisturize skin. • Nourishing, Vitamin C rich, Apple Fruit Extract helps condition and hydrate dry, mature skin helping it to renew and revive skins healthy radiance. • Cogon Grass Extract helps nourish skin with Potassium, Vitamin and Mineral based properties leaving skin supple, soft and smooth. • Non-greasy, light weight formula coats skin with a layer of moisture while gently cleansing skin.